The market for LCD displays is undergoing rapid growth centered on notebook computers, cellular phones and LCD televisions. LCD televisions, in particular, are becoming larger and less expensive thanks to technological innovations and the ramping up of mass production. With the appearance of 4K TV sets etc, the consumer appetite for LCD televisions is growing, so demand is expected to continue to expand going forward. CoorsTek provides a variety of materials that are essential to the LCD display manufacturing process and help raise production efficiency. CoorsTek has developed and supplies a variety of fine ceramic products that are needed to manufacture semiconductors, including quartz glass, carbon products, and silicon carbide products. The purification, processing and evaluation technologies we have developed out of this are highly competitive when applied to the manufacturing process for LCD displays as well, which is quite similar. We provide a diverse array of materials for the manufacturing processes to help rationalize and streamline LCD production. 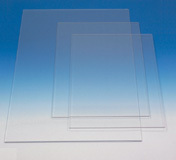 Products that have earned a strong reputation with our customers include synthetic quartz photomask substrates, a strategic product that improves the exposure precision of micro-circuitry, vacuum breaking filters and silicon carbide materials sintered under atmospheric pressure. As LCD displays have become larger in recent years, the glass substrates that make up the displays have been growing in stride. Around 2000, the 730 x 920 mm size, called the fourth generation, was mainstream. By 2005, mass production had been initiated for the seventh generation (1,870 x 2,200 mm) and, in 2006, mass production began on 2,160 x 2,400 mm displays, the eighth generation, as the move to larger sizes has accelerated. In conjunction with this evolution, greater precision and proprietary expertise has come to be required for materials production as well. We already have a system in place to accommodate growth in the size of photomask substrates thanks to our synthetic quartz purification and polishing technologies and unique know-how in the area of mass production, so are ready to meet the rising demand to come. These current control filters for vacuum breaking*1 use the pressure buffering effects possessed by porous ceramics. They render unnecessary the slow vents*2 that used to be required for vacuum breaking and are effective in reducing particles and preventing particle outbreaks. This product is used not only in the deposition step, but also in the exposure and etching steps. An operation that returns a load-lock chamber from the vacuum state it was in during processing back to atmospheric pressure. A device for slowly introducing nitrogen gas into a load-lock chamber in order to prevent particles from billowing up. Synthetic quartz photomask substrates offer extremely high purity (10% or less of metallic impurities compared with conventional quartz glass), exceptional homogeneity, and outstanding ultra-violet light transmittance due to minimal striation and bubbles. Use of quartz keeps thermal expansion at a minimum and etching from expanding in response to optical heat. This helps enable high precision patterning. This ceramic material is next in hardness to diamonds while also being lightweight. It is highly regarded as a material for ultra-flat, lightweight platforms that do not bend or warp, making possible accurate exposure. This product is used as a roller to convey TFT array substrates. Using highly pure silica glass serves to prevent metallic contamination and damage from particles. For this reason, it is also used for conveyance in the manufacture of sheet glass for flat panel displays (FPD). Quartz chambers are used as batch furnaces inside heat treatment systems for thin film transistor (TFT) array substrates, which are main type of LCD display using the active matrix method. Compared to metal, quartz is capable of restricting the occurrence of particles to an absolute minimum and it helps prevent metallic contamination.